A retired college professor, photography is my oxygen. I enjoy being out in nature or almost anywhere with my camera. The Open Photography Assistant Superintendent at our county fair for two years, I enjoy photographing the children at the fair, as well as rodeo events. One of my favorite things is finding wild animals that march to the beat of their own drum, behaving outside of the "norm". 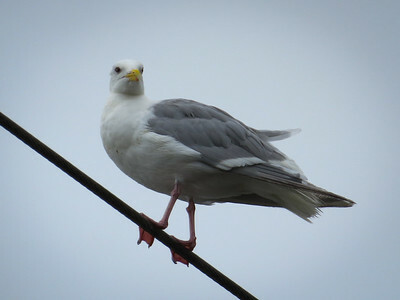 In this photo, you see a seagull standing on a power line. For those of you who don't live where Seagulls fly... Seagulls have webbed feet. They don't stand on wires... unless of course they're this guy.